What is Prayer of the Intellect and of the Heart? Remembrance of God demonstrates communion with Him and is therefore like prayer. Striving to invoke the holy Name of Christ continuously, through the prayer ‘Lord Jesus Christ, have mercy upon me’, is a constant renewal within us of the remembrance of God and communion with Him. This is why Saint Paul wrote to the Thessalonians that they should ‘Pray without ceasing’. 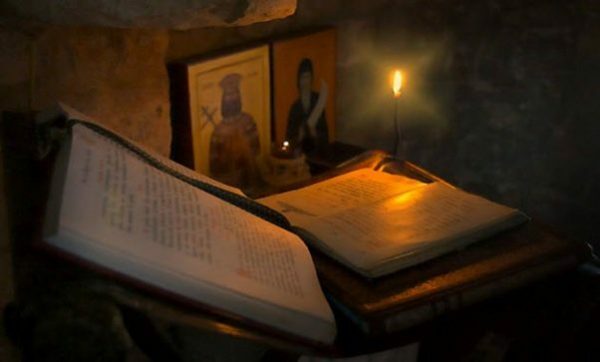 Through the remembrance of God and prayer, we reveal the true nobility of our nature, which stands at the threshold between the visible and invisible worlds and is that of a ‘deified animal’ [Saint Gregory the Theologian, Oration 38.11 (PG 36: 324)]. This nature transcends physical necessity, expands our existence as far as God and has a sense of freedom from those things which hold us prisoner on earth. For prayer to be real, however, it must involve the whole person, not only the lips, or the intellect or the heart. Perfect prayer is of the heart and intellect simultaneously. The intellect prays through the heart, which is the centre of existence. In other words, the whole person prays from their depths and their centre, thus fulfilling the Lord’s injunction: ‘You shall love the Lord your God with all your soul and with all your heart and with all your strength and with all your mind; and your neighbour as yourself’. The whole person is offered to God. For this prayer we use the Jesus Prayer: ‘Lord Jesus Christ, have mercy on me’, which, with its short invocation, helps the mind to concentrate and the intellect to descend into the heart. From their own experience, the holy, or niptic, Fathers wrote about the method and manner of this prayer. Some of the works by these holy Fathers are collected in the Philokalia [‘love for the beautiful’], a most apt name, since through prayer of the intellect and the heart, the faithful are united with God and are seen by Him, Who is most resplendent, supreme beauty. Since there’s a danger of confusion between prayer of the heart and the various forms of meditation and prayer practised in Eastern religions, I think certain issues should be clarified. 1. Not only the Jesus Prayer, but every prayer of the Church, such as the fundamental, God-given Lord’s Prayer, the ‘Our Father’, should come from the depths of our being, that is from the heart and the intellect. 2. For us Orthodox, acquisition of the gift of unceasing prayer of the intellect and the heart isn’t, in the main, a matter of method and technique, but has more to do with heartfelt contrition, that is a heart which repents, suffers over its sins and has become humble. Without such a heart, no method or prayer technique, such as the control of inhalation and exhalation, will bring true prayer. 3. Prayer of the heart and the intellect depends on our participation in the life of the Church, in its sacraments, in observance of God’s commandments and obedience to a spiritual guide. In other words, it’s not an individualistic/ personal approach to God. Through the Church, humble Christians receive God’s Grace and this Grace activates true prayer within them- naturally with their co-operation and consent. In concluding my remarks on the question of prayer, I’d like to say that people today are in particular need of prayer to prevent their being swallowed up by the modern, profoundly materialistic way of life. They’re in danger of losing sight of their divine provenance, that is the fact that we have a divine point of departure and a divine destination. We also need prayer to retain our inner unity, balance and peace amid the terrible fragmentation of the modern world, its extroversion and lack of balance, so that, with the continuous sense of God’s presence and providence in our life, we don’t worry, despair and experience the world as a meaningless vacuum. With the continuous invocation of the most sweet and holy Name of Christ, we’ll feel Him in our heart, we’ll avoid sin and we’ll cultivate feelings of love towards God and other people. We ourselves will become peaceful and our peace will spread to others around us. Allow me a brotherly piece of advice from the Holy Mountain: the more times a day we earnestly say the Jesus prayer, the closer to God we’ll be and the more Grace and strength we’ll receive to face the various difficulties and temptations of life. Source: Αγιορειτική Μαρτυρία, vol. 2, pp. 72-74.